Don’t blame yourself. It’s been subconsciously downloaded and wired into our brains that multitasking is good. Multitasking is for smart, capable people…the “go-getters.” Multitasking is efficient, saves time, and increases productivity, right? Wrong. The truth is, the concept multitasking is largely a myth. Physiologically, the human brain is not designed to process more than one thing at a time. Actually, to be more specific, the human brain is incapable of effectively handling more than one task. What is actually taking place is the “switching” of one task to another. In other words, there is no “multi” anything going on. 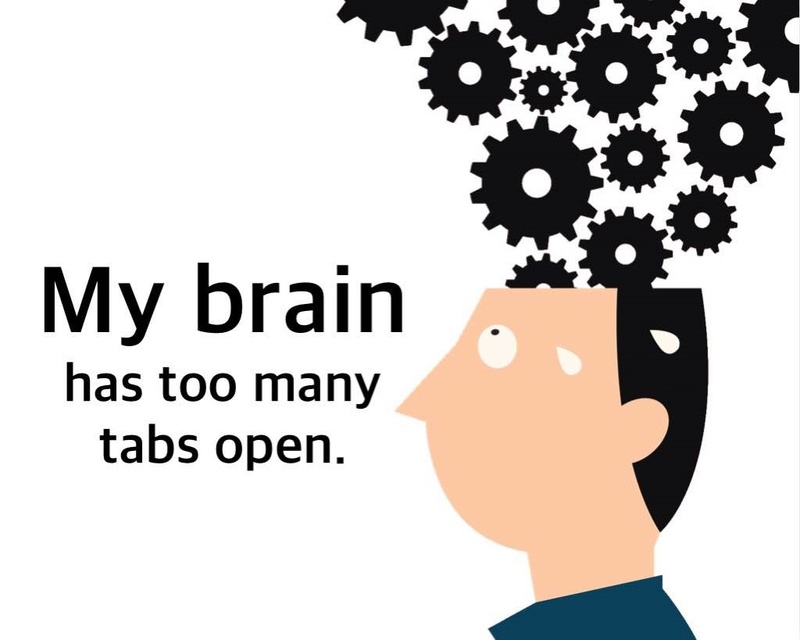 This switching from one task to another is actually harmful to the brain’s natural makeup. Here are 5 reasons you may want to stop multitasking. #1 Multitasking makes you less productive! Well, that’s a bummer isn’t it? I mean, being productive is reason numero uno why many people do it in the first place. According to the American Psychological Association – the largest scientific and professional organization of psychologists in the United States – multitasking creates mental blocks that can result in as much as a 40 percent loss in production time. Instead, choose to prioritize your workday. Identify the most important things to get done for the day and then simply do them one at a time. Remember: time management isn’t about getting more done in less time; it’s about completing the most important things effectively. 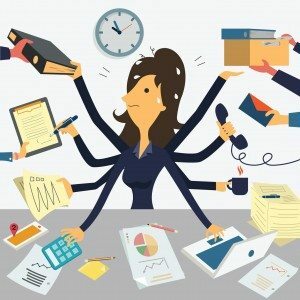 #2 Multitasking is stressing you out! When you multitask on a regular basis, your brain releases a chemical called cortisol which, if chronic, can make you susceptible to heart disease, weight gain, high blood pressure and diabetes. In a study at the University of California Irvine, one group of employees was given access to email and messaging while the other group was not. The group that received a regular influx of messages displayed higher blood pressure and heart rates when compared to the other group. Further, mental health issues can arise from multitasking as well. Researchers believe this is related to poor outcomes (on work, tests, etc.) as a result of multitasking. These unintended consequences can result in self-esteem issues and even depression. #3 Multitasking is hurting your work! Multitasking has a detrimental effect on the quality of work performed. Even routine tasks, such as driving a car, are performed with less precision when doing something else. We used a…driving simulator to compare the performance with cell-phone drivers with (those) who were legally intoxicated from ethanol (alcohol). When…conversing on either a hand-held or hands-free cell phone, their reactions were sluggish… (the cell phone group) attempted to compensate by driving slower and increasing the distance from the vehicle immediately in front of them. When controlling for driving difficulty and time on task, cell phone drivers exhibited greater impairment than intoxicated drivers. Quite simply: to do your best work, Single-task! #4 Multitasking makes you miss out on life! Adding to its already abysmal record, multitasking makes it impossible to remain present. In addition the harm that multitasking causes to your brain, it is quite possible that multitasking is hurting your relationships as well. You may even notice it within your family. Have you ever been talking with your child only to have them pull out their iPhone? How about when speaking with your husband or wife only to see them dart for their Blackberry? “I have to check some work stuff,” they say. Present-mindedness is not something that is practiced often in our society. Even before the advent of iPhones and other mobile devices, people were still preoccupied with work and meeting the demands of their schedule. Do not (consciously) look at, listen to, touch, smell, or taste (eat) while interacting with someone. Even if the other person does otherwise. The basis of this practice is to give full attention to a person or task. #5 Multitasking makes you dumber! 62% of people checked work messages at home or on vacation. Workers distracted by incoming calls and messages experienced a 10-point drop in IQ – more than twice of the impact of smoking marijuana. Researchers equated the drop in mental sharpness as a result of technology overload to losing a full night’s sleep. Keep a short list (3 or so) of the most important things to do today (MIT’s, or “Most Important Tasks). Do not do anything else before completing MIT’s. No Facebook, email, Twitter, etc. Clear away distractions. Turn off cell phones, incoming emails, TV, etc. One task at a time. Focus only on one task until it’s done and then move on. When feeling a loss of focus, gently bring your attention back to the task at hand. Keep going on your MIT’s. Resist the urge to do less important stuff. When important thoughts arise, write them down and store them away for later. With a little bit or work and dedication, you can make yourself into an excellent, productive single tasker! Remember: keep the distractions to a minimum and focus on what’s most important!